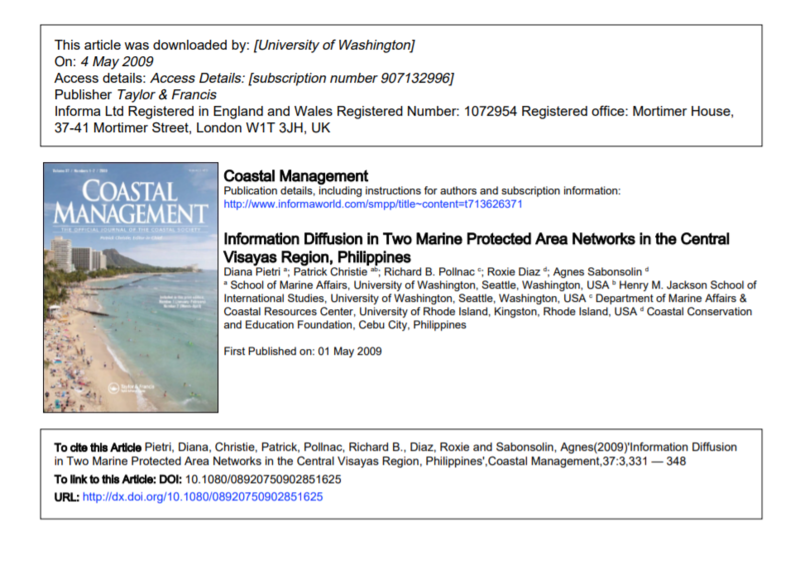 Abstract In order to strengthen biological and social success of community-based marine protected areas (MPAs) in the Philippines, many organizations have begun instituting MPA networks. In the Central Visayas Region, Coastal Conservation and Education Foundation and Fisheries for Improved Sustainable Harvest are implementing socioecological networking initiatives. Educational programs, employing diverse methods such as cross visits and community MPA monitoring, are integral components of these projects. This article analyzes the relationship between education, information diffusion, and standard measures of MPA success (e.g., MPA rule compliance and fish abundance) in communities participating in these networks. Surveys were conducted with 13 individuals per community in 36 communities. Statistical tests reveal that the presence of a clear MPA leader, participation in cross visits, and presence of community environmental education programs were the strongest predictors of social and biological MPA success. Formal education programs (e.g., management committee member trainings) independent of other processes did not demonstrate strong statistical relationships with MPA success. Overall, the findings of this study demonstrate the current and potential benefits and efficacy of education programs for communities in MPA networks. When linked to a strong infrastructure for information diffusion, education programs have the potential to increase both biological and social MPA success.